London Gatwick Airport has a range of facilities geared towards easing the journey while travelling with children, such as dedicated play areas, games and changing facilities. Changing your baby: Gatwick’s special babycare rooms designed for baby changing and feeding are indicated by either a bottle sign or a babycare symbol. You can find these facilities in the check-in area, on your way to the gates, in the transfer area and after passport control in arrivals. Some male and female toilets also have fold-down changing tables. Gatwick’s recent upgrade involved updating or adding some excellent new facilities to aid family travel. Special family assistance lanes were created for both departing and arriving families. Not only it is more spacious, the dedicated security lane provides families or single adults travelling with a child / children extra help and support when going through security (just some help folding up your buggy goes a long way!). Nobody likes a long wait. To make the waiting more pleasant for both the parent and the child, Gatwick Airport offers kids zones in the departure lounges. The zones are well equipped and include an area for the kids to play and watch TV, as well as loads of seats for parents. They are free to use, and you will find them upstairs in the South Terminal departure lounge and near Boots Pharmacy in North Terminal departure lounge. Both terminals have excellent family lounge facilities, giving families an opportunity to relax before their onward journey. Here’s a brief overview of what you can expect to get. Pre-booking is recommended. No.1 Traveller have a fantastic new Super-Lounge in the North Terminal which has some superb child friendly facilities. These include a mini cinema room, games room, computers and a place to sit down and relax. Food and drink is included so you have no reason to leave the calm No. 1 Traveller lounge and enter the hectic departure lounge. The Aspire Lounge offers a self-contained ‘Fun Zone’ area with soft play, games, and toys. Other facilities include television, complimentary drinks, and a selection of magazines and newspapers. South Terminal also offers two lounges to passengers, including those travelling with small children. No. 1 Traveller's lounge in the South terminal includes a lounge area, table football, living green room and much more. The lounge also boasts airport runway views so the children can remain entertained by watching the planes take-off. If you forget to bring colouring books, you can get them in both terminals from bookshops such as WHSmith. There are plenty of child-friendly restaurants and shops selling snacks in both terminals. Baby feeding / breastfeeding: Gatwick Airport has updated its family facilities, and one of the key advantages is that the babycare rooms not only have baby changing tables, but also chairs for nursing mothers, as well as small playpens to contain a toddler if their smaller sibling is being fed/changed. If your baby is bottle-fed, you can buy readily sterilised disposable bottles from Boots Store located airside at Gatwick. To see how Gatwick breasfeeding facilities compare with other UK airports, view this ‘Breastfeeding at UK airports’ report. Toddlers / older children: A highchair for the smaller customers is a must at Gatwick’s wide range of restaurants, cafes and bars, and so is a children’s menu! There are some amazing things you can find at Gatwick cafes and restaurants, such as oats porridge with jam and bananas (!) in the morning. In addition, you are welcome to ask for a glass of tap water, free of charge, at any Gatwick restaurant. If you still have time before your flight, you can always take the kids for a free ride on the transit train which runs every 3 minutes at peak times between the North and South Terminal. The ride takes only about 2 minutes. You will find the transit station on the first floor of the North Terminal and next to the rail station in the South Terminal. 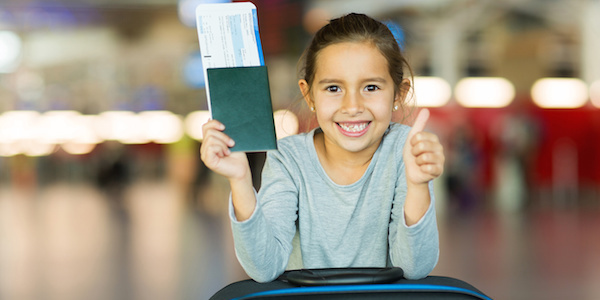 If you are travelling with children then you should try and allow yourself more time to get to the Airport and get through check in and security. Children can generally slow you down and it can take you longer to do simple tasks. This Flying with Babies and Toddlers Guide can help you pack lightly and plan your trip with a small traveller better. Gatwick Airport has recently started offering pushchairs to families arriving and landing at Gatwick, to help the passengers get from the plane to the arrivals hall where they collect their own pushchairs. Families travelling with babies and small children on British registered aircraft have two options on how their child travels. Option one. Babies that are younger than 6 months travel on an adult person’s lap with a lap-strap safety belt provided by cabin crew. Infants that are between 6 and 23 months old must also be seated on the adult’s lap, securely strapped with the lap-strap for the duration of take-off and landing. In case the neighbouring seat is empty, the infant may take that seat and use it during the flight. However you might want to ask your airline what the rules are of using these spare seats. Option two. Parents are welcome to book a seat for their infant who is six months and older if they prefer. A purpose-designed car seat can then be used, as long as it has a special restraining harness and is of the correct size to be attached to the standard seat of the aircraft. These car seats are not provided by the airlines, they must be brought by the parents. The main requirements are that this seat is in a good condition, must conform to British Safety regulations and the parent should have a manual or an instruction leaflet to show the on-board staff in case they are not familiar with the fitting process for that particular make. The car seat must not exceed 16 inches (or 40 cm) in width. Car seats are bulky items, especially if you are also taking a pushchair and / or a travel cot, so it’s essential that you check with your airline if they will be able to fit it. Please note that budget airlines might have different rules towards allowing passengers to fit their own car seats due to reduced legroom in the aircraft. Always check with the airline to avoid disappointment. If your child has reduced mobility and you would like to try the aircraft seating and transfer options in a realistic setting before your set off with your little one, contact Tryb4uFly who specialise in providing disabled adults and children the opportunity to do so. Additional aid equipment can also be hired/purchased from them. If you’re travelling with a child who has autism, you may find the following article on airports and Autism useful as it highlights what provisions are available across UK Airports to make the journey easier and less stressful for them.